BTS - Bradley and Angel – Jäger der Finsternis and Horsies (2). . Wallpaper and background images in the Arthur und Gwen club tagged: bradley james angel coulby colin morgan alex vlahos. This Arthur und Gwen photo contains reitweg, pferdepfad, pferdewrangler, wrangler, pferd wrangler, rennpferd, and bangtail. Ladies Are Du Sitting Down? Deffo Gwaine Who Moment Alert! 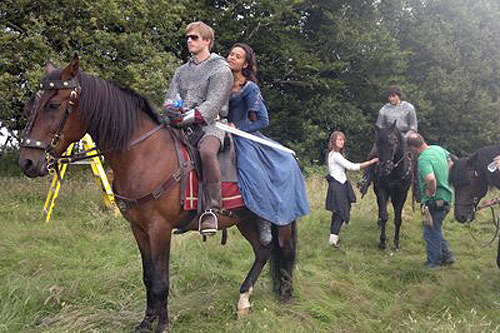 Merlin 4.08 - KISS Reprise...Yummy! aww, this pic is great! Moreee of those! Like one where she's holding onto him maybeee! This is cute, nice with the water bottle and shades on. Our medieval sovereigns who use laptops and kindles. God, I love this pic so much! Too bad it isn't hi-res! This pic really emphasizes Angel's petite size! Is it just me or does she have her chin on his shoulders? I don't know, but it looks that way! Yes Bradley. The Pert, Firm Glutes Are Exactly Where Du Left Them.